From Heim Plateau follow moderately easy rock, exposed in places, with an awkward face just below the summit. A steady rising traverse of the crevassed Heim Plateau leads to the upper icefall that spills off Blair Peak. Follow the ridge, moving on to the face when necessary, which is exposed towards the top. This route can get cut off just below the summit in late season. From the Swift Water From the Swift Water, follow up the north west slopes under Blair and gain the North Ridge. 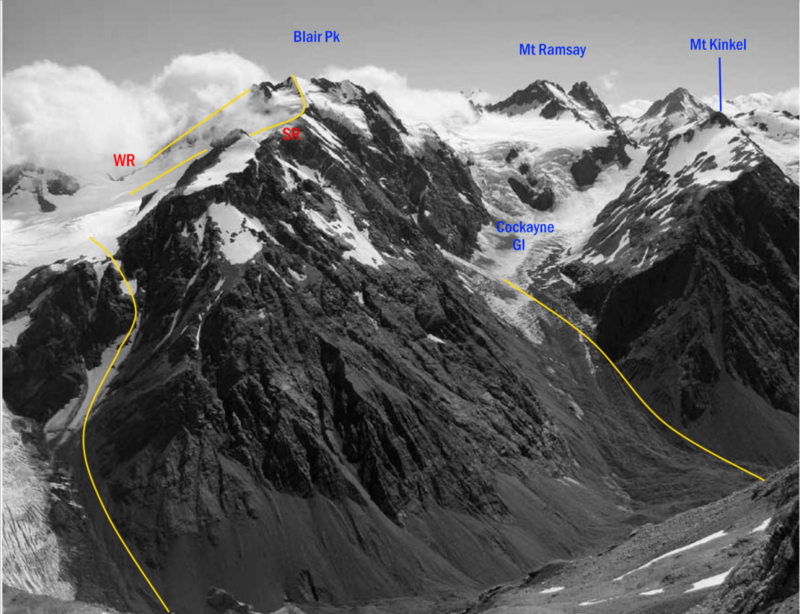 A section of rock can be avoided by going to climbers right on snow and when this steepens markedly can be sidled off further right to gain a gentle ridge below the summit. Paul Richardson, Roger Redmayne, Trevor Bissell, Tony Gazely, January, 1986. From the Radiant Glacier, follow up snowslopes between the north and north east ridges. Descended by Paul Richardson, Roger Redmayne, Trevor Bissell, Tony Gazely, January, 1986.